The X's-and-O's behind the rookie quarterback's success. By Josh Paunil·	 9/14/2016, 2:26 p.m.
No matter how much film you watch, how long you spend researching someone’s background or how extensive your interview process is, you don’t know exactly what you’re going to get from a football player until they, you know, actually play some football. Carson Wentz looked impressive during training camp because of his big arm, and he gave coaches reason to be optimistic when he used his mobility to extend plays in the preseason. But even as he continued to check boxes in the limited action he saw throughout the spring and summer, no one knew for sure how he’d respond to NFL defenses, the speed of the game and complex blitzes he probably didn’t see against South Dakota State. He wasn’t just comfortable, he was productive, too. Wentz’s 278 passing yards against the Browns were the fourth-most ever by an Eagles rookie quarterback, and his 101 passer rating was the highest mark among the same group of people in more than 40 years. It’s important to keep perspective: Wentz played against what looks like one of the worst defenses in the NFL, and Cleveland was without their two best pass-rushers from last season. Plus, it was difficult for Browns defensive coordinator Ray Horton to game plan for Wentz because there was very little film of the rookie quarterback in Doug Pederson’s new offense. Still, even when you throw away Wentz’s impressive numbers, he simply looked good on film. So we talked to players and coaches about the X’s-and-O’s of Wentz’s debut, and we called J.T. O’Sullivan, an old friend of Birds 24/7. The former NFL quarterback spent almost a decade in the league, including several years in the West Coast Offense and one in Green Bay with Pederson, so he was able to help break down some of the concepts for us. 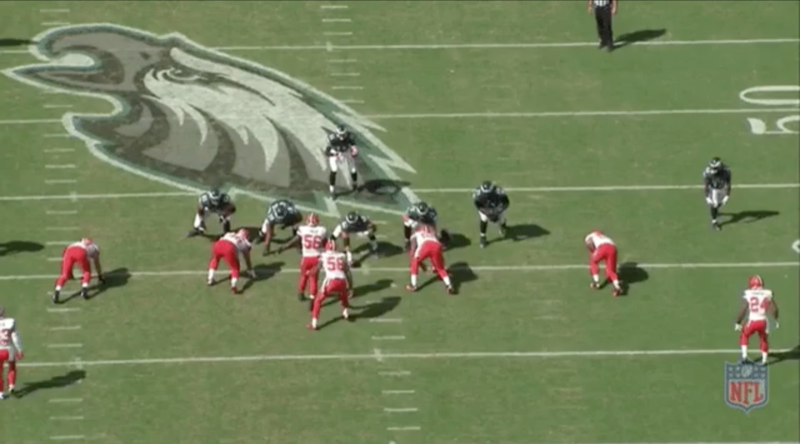 Pederson’s game plan for the opening drive was simple: Get the 23-year-old from North Dakota State comfortable. 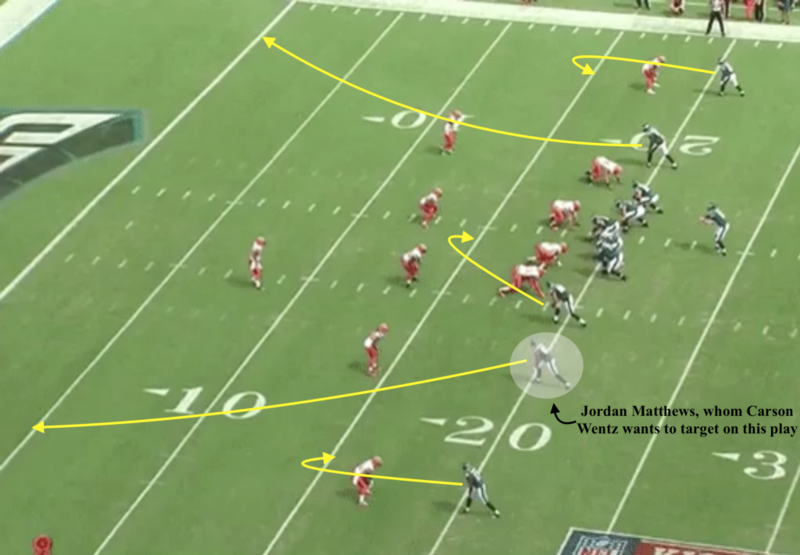 The Eagles established the run and moved the pocket to get Wentz some easy completions, and when they entered the red zone, Pederson dialed up a play Wentz had worked on a lot with Jordan Matthews in the week leading up to the game. Facing second-and-9 from Cleveland’s 19-yard-line, the Eagles came out with an empty shotgun formation in 11 personnel — one running back, one tight end and three wide receivers. Nelson Agholor was the outside receiver to the strong side, with Matthews and Zach Ertz inside of him. 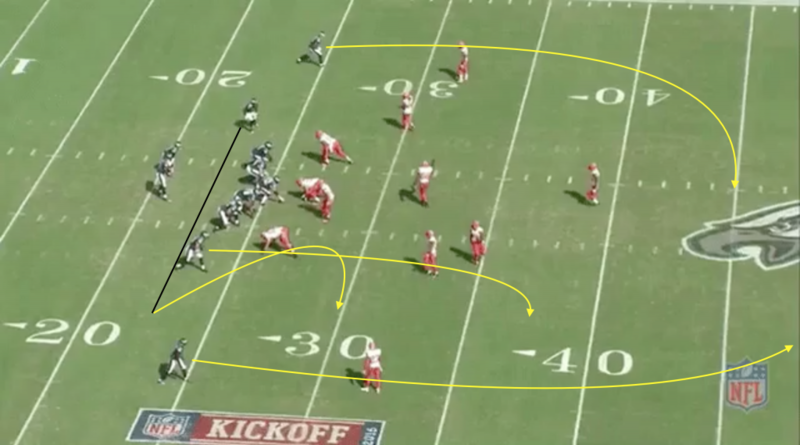 On the weak side of the formation, Darren Sproles was the outside receiver, while Dorial Green-Beckham was in the slot. Both Agholor and Sproles ran five-yard hitches, with Matthews and Green-Beckham running fades. Ertz, meanwhile, ran what O’Sullivan called a five-yard “sit” route in the middle of the field. The Browns responded by running man-to-man coverage with one safety over the top (cover-1 man). According to O’Sullivan, Pederson put in both man and zone coverage beaters in this play. The zone beaters are the outside hitches and the sit route, while the man beaters are the two fade routes. In most NFL offenses, the hitches can convert to fade routes against press coverage, but they couldn’t on this play because of the inside fades. O’Sullivan also noted that most teams who use sit routes have another play where the tight end can turn it into a “juke” route by breaking to either side of the field, so he wouldn’t be surprised to see that in the future as a spin-off of this play. The Eagles did get the matchup they wanted, in addition to the type of coverage they hoped for, so Wentz knew he was going to Matthews as soon as he diagnosed the coverage. Wentz threw a beautiful ball for a 19-yard touchdown pass, which was “huge” for his confidence, he later said. When Pederson first came to Philadelphia, one of the first things he said about Sam Bradford was he wanted to take advantage of the veteran quarterback’s intelligence by giving him freedom at the line of scrimmage. With Wentz now in, it seems Pederson is still giving his quarterback plenty of pre-snap flexibility. Facing first-and-10 from Cleveland’s 35-yard-line, the Eagles came out with a single-back formation in 12 personnel. 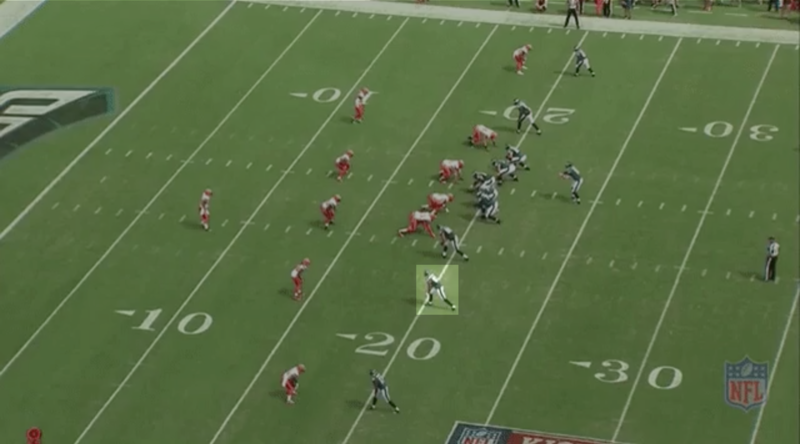 Agholor was split out to the right, with Matthews in the slot. On the opposite side, Brent Celek was on the line of scrimmage to the left of Jason Peters, while Ertz was off of the line next to Celek. 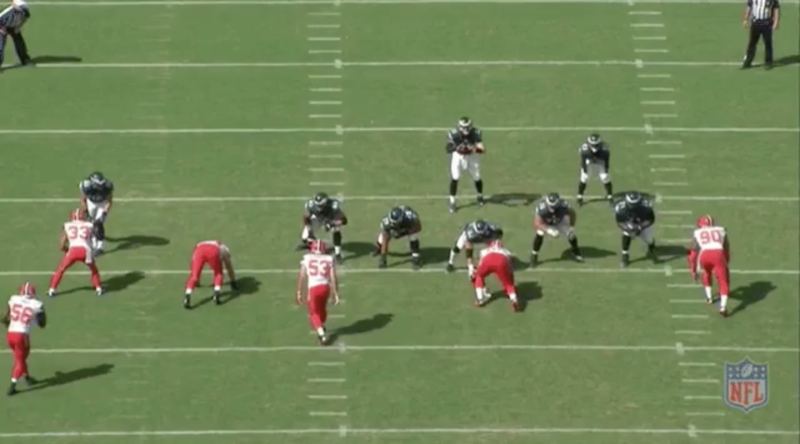 The play design reminded O’Sullivan of a similar concept Andy Reid loved using with Donovan McNabb. 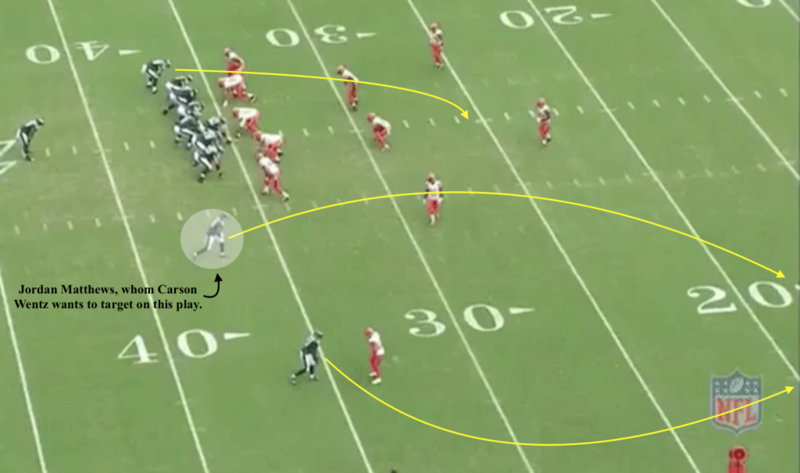 According to O’Sullivan, Reid would called a similar route combination where the Eagles would run some type corner route along with a “clear” route, which was supposed to clear space for the receiver running the corner. On this snap, Ryan Mathews was by himself in backfield, but then Wentz saw a blitz coming, so the quarterback adjusted the pass protection and dropped back in shotgun. Wentz told everyone else about the blitz, which signaled to Matthews to speed up his route. The offensive line gave Wentz plenty of time to throw the ball, which ended up being a 28-yard completion to Matthews for the Eagles’ second-longest play of the game. When Pederson addressed the media on Monday, he had to pause at one point and take a second to think. He was asked which one of Wentz’s play impressed him the most, and — probably to his delight — he had to make a difficult choice between several good throws. In the end, he picked two, one of which was Wentz’s 24-yard bullet to Matthews over the middle in the third quarter. Facing third-and-9 from their own 26-yard-line, the Eagles came out in shotgun with 11 personnel. Matthews was split out to the left, while Josh Huff — before motioning to the right side of the formation — was in the slot. 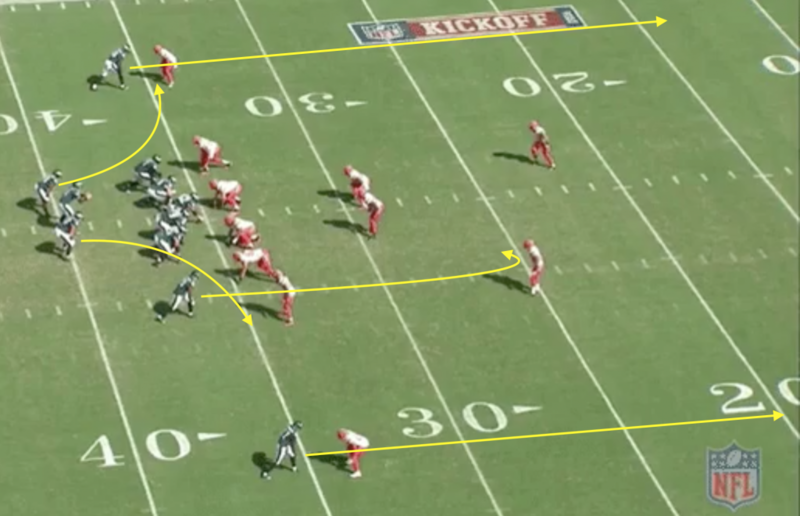 On the opposite side, Agholor was split out to the right, with Ertz in the slot and Sproles in the backfield. According to Matthews, the play is designed to beat man coverage on the right side, while he runs a “dig” route on the back side to find a void in the middle of the field. Similar to his touchdown catch, Matthews knew the ball was coming to him because Wentz said during the week he’d target the receiver if the Browns were in zone. According to O’Sullivan, the Eagles were “pretty well beat” as there “weren’t a lot of great options” for Wentz to take advantage of. 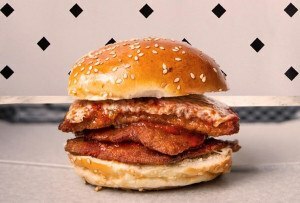 But Wentz through an outstanding — albeit risky — strike for the first down. “For him to have that kind of poise in the pocket for his first start and really only having about four series throughout the entire training camp, you just can’t teach that, ” Pederson said. “And the patience that he had to let receivers come open. I remember that one third-down play, he hit Jordan on a backside (dig) route, he just hung in there, hung in there, and it was a nice, tight-window throw. Pederson’s other favorite throw? That was on the Eagles’ next drive. After Wentz threw an incomplete pass to Matthews on third down, Pederson didn’t hesitate in his decision to go for it on fourth-and-4 from Cleveland’s 40-yard-line. Wentz wasn’t surprised because of Pederson’s “aggressive nature,” but he was “excited” Pederson had enough confidence in him to convert the first down. The Eagles came out with an empty back shotgun formation in 11 personnel. Agholor was the outside receiver to the three-receiver (trips) side, with Matthews and Ertz inside. 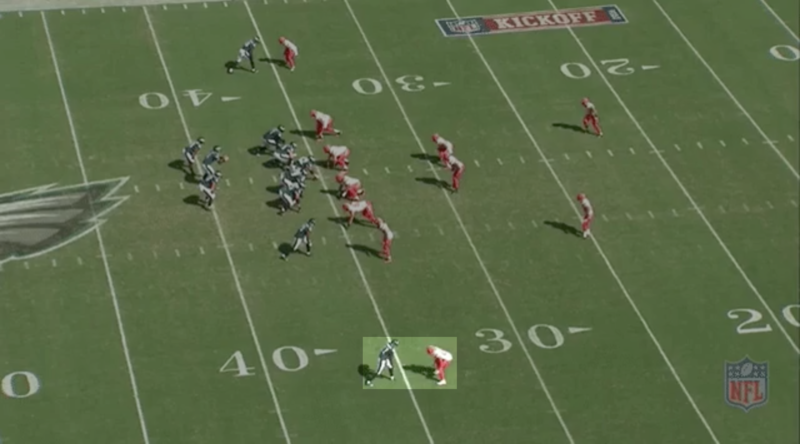 On the boundary side, Green-Beckham was outside while Sproles was in the slot. The three receivers on the trips side all ran some type of slant or short in route, which — when combined — is a concept called “lion,” according to O’Sullivan. 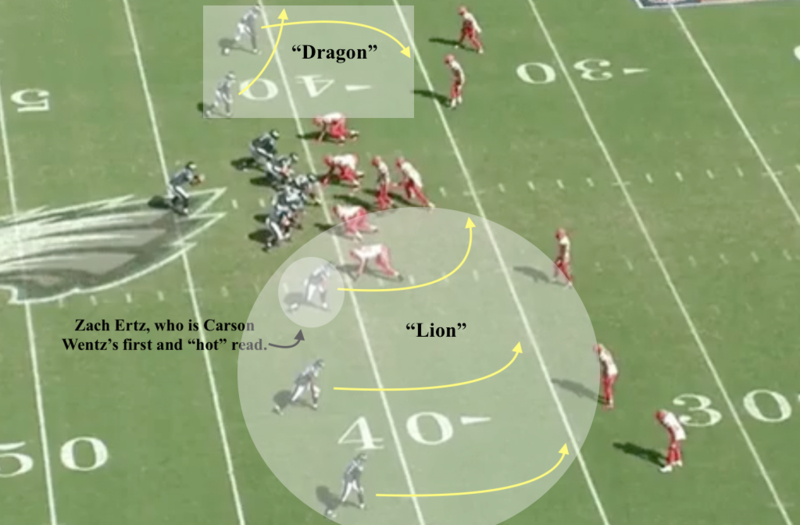 To the left side is a concept called “dragon,” or a quick slant coupled with a flat route. The Browns blitzed and brought one more defender than the Eagles could block, but there was some type of breakdown in the pass protection so the free runner came right up the middle in Wentz’s face, instead of from the outside. Still, the rookie got rid of the ball in time and hit Ertz, who was both his first and “hot” read, over the middle for the first down. Facing first-and-10 from the Browns’ 35-yard line, the Eagles came out with an old school West Coast Offense play O’Sullivan calls Shotgun Red Right Zebra 74 Double Go. According to O’Sullivan, in West Coast Offense terminology, “Red” means split backs, “Zebra” is the personal group (11) and “74” is a pass protection. Agholor had a great release against Browns Pro Bowl cornerback Joe Haden, and Wentz delivered a fantastic pass deep down the field. That score increased the Eagles’ lead from five to 12, and it completely turned the tide of the game. No matter how you look at it, Wentz impressed against Cleveland, even if you don’t take into account his rookie standing. But now other teams have informative film on the quarterback, and Wentz will have to make adjustments on the fly to not get caught in a trap. O’Sullivan pointed out how on both touchdown passes, the Browns were in some type of cover-1 man defense. 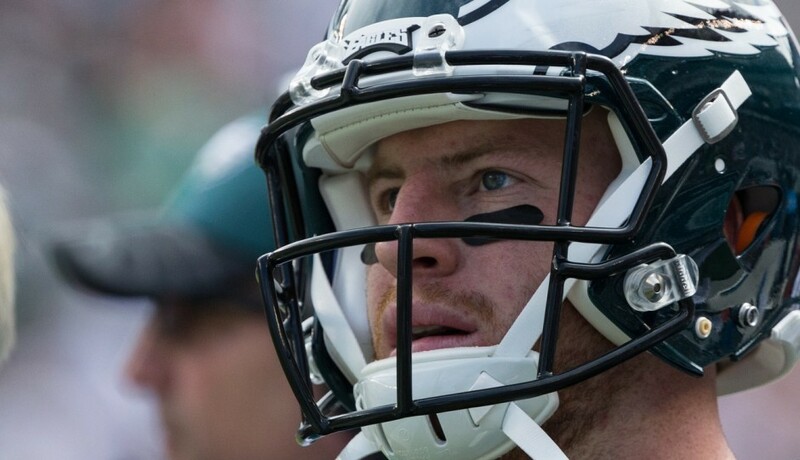 Because of how well Wentz threw those fade balls, O’Sullivan said he “can’t imagine” Wentz will see this look again any time soon in or around the red zone. Instead, O’Sullivan suggested the Bears may use quarters coverage, which he called a “safer” defense and one that would better take away fade routes. That’s just one small note in the chess game Wentz and Pederson will have to play for the rest of the season. But for now, the kid the Eagles are banking on to be their franchise quarterback will try to do one simple thing: enjoy the ride.